In the summer time, we all know how important it is to stay hydrated. Water is great but might not “stick” to you so well. Hot tea is not usually so appealing during these warmer months and juice can be a bit too sweet. While Ayurveda does not generally recommend drinking iced or refrigerated beverages, cool or room temperature drinks can be pretty refreshing. Summer is a great time for cool teas and infusions or sweet herbal syrups with water. Hibiscus’s sweet, astringent and cooling nature soothes pitta and kapha (in excess it can provoke vata). This means it reduces excess heat and inflammation and acts as a mild diuretic. It’s ability to cool hot heads in the summertime points to it’s traditional use in supporting hair-growth or slowing hair-loss. Hibiscus flower tea or decoction can also ward off a heat and stress induced migraine in it’s early stages. 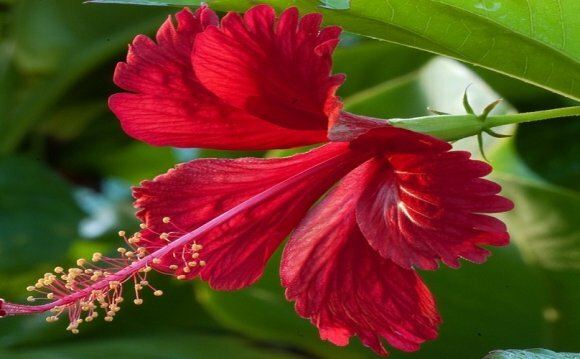 Many cultures use the beautiful Hibiscus flower to purify the mind and body and as an offering in devotional ceremonies. When I was receiving treatment for inflamed, stressed out eyes in India, the last part of the treatment involved laying petals of white Hibiscus over my eyes. The light delicacy of the flower was the sweetest nourishment! You can find dry hibiscus flower in most herb stores. Some grocery stores, like Whole Foods, also sell it. Try to buy it as a single herb, if you buy it in tea bags it is usually already combined with ginger or lemon. Combining hibiscus with vanilla bean and natural, unrefined sugar (yes, even sugar is a medicine when it is used at the right time) counters the potentially vata-provoking character of the flower and makes a delicious, refreshing summer cooler. Vanilla is also a wonderful cooling and soothing herb. It soothes both vata and , which means it can soothe anxiety and stress and is also used as an aphrodisiac in Ayurvedic preparations. -Place all ingredients in a large pot. Bring to a boil and then lower to a simmer. -Continue to cook on med-low heat until the water volume has reduced by half. -Allow syrup to cool and then strain. -Add a tablespoon or so of the syrup plus a teaspoon of lime juice to 8-10 oz. of water. But even just added to water, you can use this syrup as an iced-tea concentrate.